Dietary protein intake is an important number to get right. If you eat too little protein over a long stretch, your body will suffer. If you eat too much protein, you could be at greater risk for kidney problems, and your blood glucose may rise, requiring a release of insulin. Exactly how much protein you should eat depends on several factors. Your size and activity level are two. “How Much Protein Should You Eat Per Day?” Kris Gunnars. HealthLine. June 8, 2017. The Art and Science of Low Carbohydrate Living: An Expert Guide to Making the Life-Saving Benefits of Carbohydrate Restriction Sustainable and Enjoyable (aff. link). Jeff S. Volek and Stephen D. Phinney. Beyond Obesity, 2011. 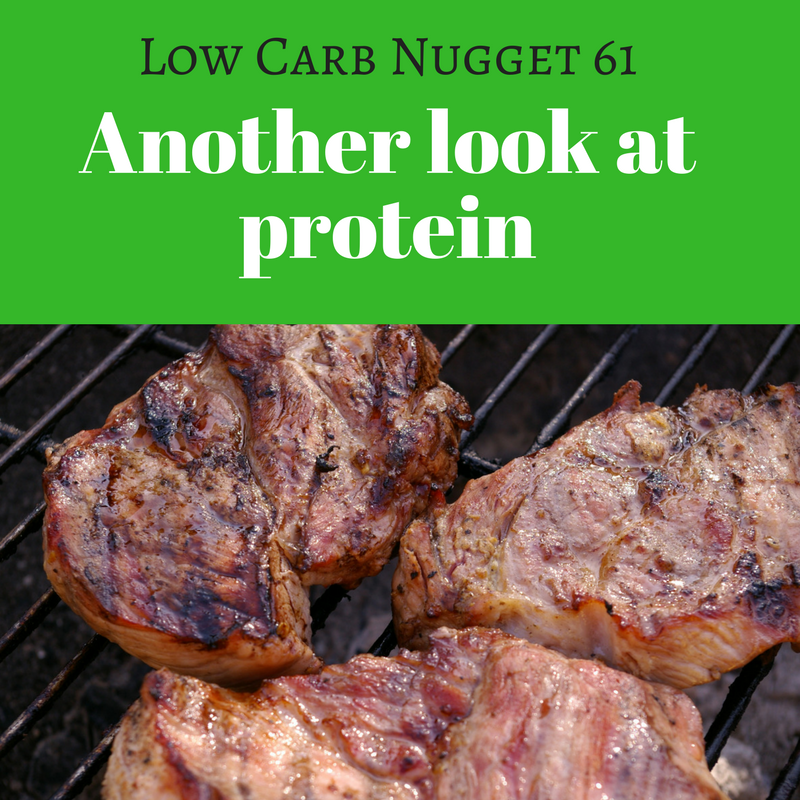 This is Episode 61 of the Low Carb Nugget for Tuesday, September 26, 2017. I’m Jim Anderson. I’m only two days into my Keto Diet Reboot, and already I’m questioning one of my daily macro-nutrient targets. It’s my protein target. I set my protein target based on the standard dietary recommendation that an average sedentary male needs about 56 grams of protein per day. I am a male, and I am sedentary. In many ways, I may also be average, but physical stature isn’t one of them. I’m a fairly large guy. So I bumped my protein target up a bit to 65 grams of per day. As it turns out, that was still too low. The standard advice is to eat 0.8 grams of protein per kilogram of body weight. That translates to 0.36 grams per pound. So, this average sedentary male who only needs 56 grams a day to sustain himself would weigh around 160 pounds. I haven’t weighed 160 pounds since junior high school. I’m a lot bigger than average, I guess. In fact, at my full height of 6 feet 2 inches, the lightest I’ve ever been was 180 pounds. That was back in high school. At 180 pounds, I’d need 65 grams of protein a day to sustain myself, assuming a sedentary life-style. Well, I’m not 180 pounds anymore. Yesterday, to kickoff my Keto Diet Reboot, I weighed in at 227.5 pounds. Multiplying that number by 0.36 gives a result of 81.9. So, I should eat about 82 grams of protein per day, at least to start out. As my weight drops, I’ll need to adjust the protein target downward. It’s a moving target. Yesterday, I almost hit my new protein target exactly, consuming 80 grams even. That was along with just 15 grams of net carbs, and 175 grams of fat. My target for net carbs is no more than 25 grams per day, and for fat, at least 160 grams per day. So, I did a great job on the first day of meeting or exceeding all my macro-nutrient targets. Overall, I ate slightly under 2,000 calories, with 79% from fat, 16% from protein, and 5% from carbohydrate. That is a true high-fat, moderate-protein, low-carb approach. A fat burning approach. Naturally, I was reward by a weight drop, right? A couple pounds, at least? Well, no. I gained half a pound. No big deal. It’s only one day. To go back to the topic of dietary protein, it’s an important number to get right. If you eat too little protein over a long stretch, your body will suffer. You need sufficent protein to renew and rebuild your bodily tissues. Or to build new muscles if you’re exercising for that purpose, which I am not. An athlete needs more protein than a sedentary person. In their book, The Art and Science of Low Carbohydrate Living, authorities Jeff Volek and Stephen Phinney suggest that athletes need between 1.5 to 2.5 grams of protein per kilogram of body weight, which is twice to three times as much as a sedentary person. But if you eat way too much protein, your body doesn’t store the excess, but converts it to glucose through a process known as “gluconeogenesis.” To some degree, this process is regular and necessary — and again I’m drawing on Volek and Phinney. Your body will maintain a certain level of blood glucose even if you eat a zero carb diet. Parts of your body, such as your eye lens and red blood cells, need to be fed glucose; they can’t burn ketones. Hence, gluconeogenisis. This need is factored into the standard recommendations for protein intake. Eat more protein than you need, and it will contribute to elevated blood glucose, which will require more insulin to be released into your bloodstream. Insulin is the fat-making, fat-storing hormone. The central idea of a low-carb diet is to reduce the need for insulin and improve insulin sensitivity. Then your body can better burn its own fat for fuel. To sum up, I’ve adjusted my protein intake target to 82 grams a day — for now. I will be posting regular updates about my Keto Reboot Diet on my blog “Life After Carbs,” every Monday, Wednesday and Friday. I’ll give occasional updates on this podcast, too, but not every episode. There’s other stuff to talk about.